This 1914 Platt Book map shows the Town of Sumner with the city of Osseo ( altho Lake Martha appears to be on the wrong side of town) . Sumner was settled in 1856. The first settlers were E M Sexton and W A Woodward. 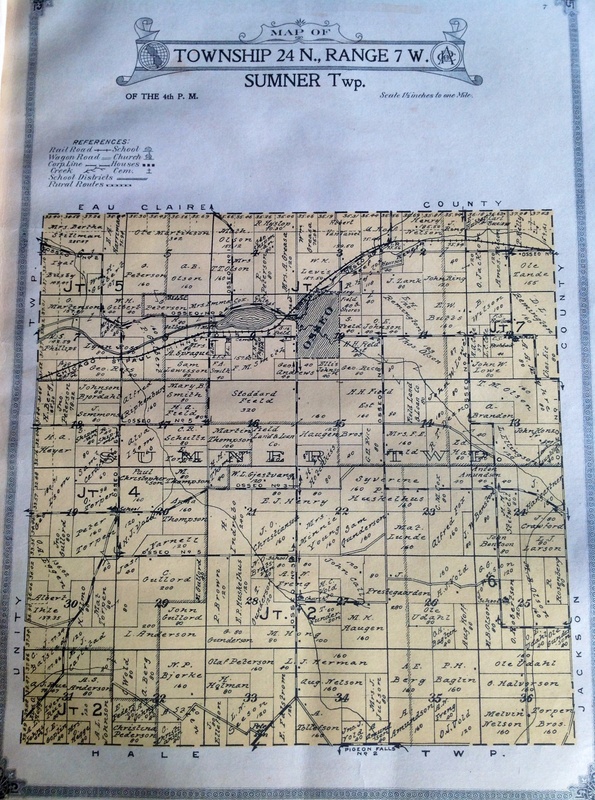 The post office was started in 1857 at Beef River Station which was a mile west of Osseo. George Silkworth was the first post master. Osseo was established in 1858 by WH and CG Thomas when they built the first store. Robert C Field gave the new village the name”Osseo” purportedly from a character in Longfellow’s ‘Song of Hiawatha’. The Town of Sumner was named for Charles Sumner, a famous American Senator who was an abolitionist and adviser to President Lincoln. The Beef/Buffalo River takes its name from the French word ‘Beeuf” which was the designation applied by the early French Explorers to the American Bison/Buffalo. King’s Valley. located to the southeast of Osseo, was named for James King, a prominent farmer. Tracey Valley was named for AD Tracey who settled in the valley in 1859.